At The New Deli, we discovered that a great time saver was to make a big batch of a spice mix, with a tomato paste base. The salt and vinegar in the mix make it keep well in the refrigerator, for months on end. 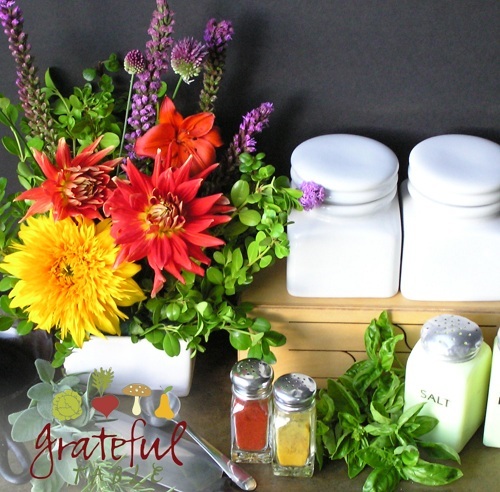 We add the base spice mix to other foods, to make stuff like 1000 Island Dressing, Oriental Sweet and Sour dressing, in meatloaf, and in soups. We use a 7 lb. can at the deli, but even if you make a much smaller batch, it’s bound to save you time. Makes about 3 c.
Blend all eight ingredients and keep mixture refrigerated, in glass mason jar, for two months or so. To make 1000 Island dressing, just add some to mayonnaise, until it’s the right color. This extra-rich, decadently chocolate cake is also a quick and easy recipe, with a minimum of ingredients. The original recipe called for Kahlua liqueur (see recipe here), but this version saves money; just use a homemade blend of espresso and maple syrup. The original recipe called for a cup of espresso and a 1/4 c. Kahlua; because the Kahlua’s sweet, when I left that out I added in some maple syrup. Throw the ingredients together, bake, and enjoy a dense torte akin to mousse or pudding, with no fuss. Serves 15 or so; can easily be reduced by half to serve a smaller crowd. 1. Bake in unbuttered pan, lined with aluminum foil (heavy duty works best). Use a large, 10-inch pan, or 2 smaller pans. Preheat oven to 300 degrees. 6. Bake at 300 degrees for 65 min. for a 10″ pan, or 30-40 min. for 2 smaller pans. 8. Serve with whipped cream or berries. A raspberry sauce can also be drizzled onto the plates before serving. 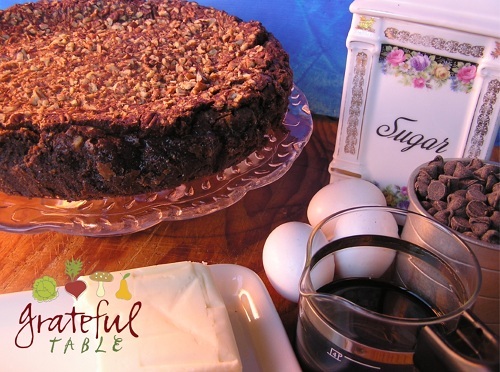 This torte a minimum of ingredients–a super easy recipe. There’s not even gluten in it, for those looking for gluten-free. It is traditionally made with Kahlua; for a non-alcohol version, see this page. If the 10″ pan is not available, smaller sizes can be used; just cook the cake longer. It won’t set up as traditional cakes set up (don’t bother sticking a toothpick in). But it will seem fairly “set” when giggled. Let it cool completely before serving. Serves 15 or so; can easily be reduced by half to serve a smaller crowd. 1. Bake in unbuttered pan, lined with aluminum foil (heavy duty works best). Use a large, 10″ pan, or 2 smaller pans. Preheat oven to 300 degrees. This is a memorable holiday cake in our family. If you’re not big on rum, skip the alcohol, using other flavorings. Serves 12. 6. Fold the above ingredients together, incorporating the flour into the whipped egg yolk mix alternately with the melted butter, folding the egg whites in last of all. 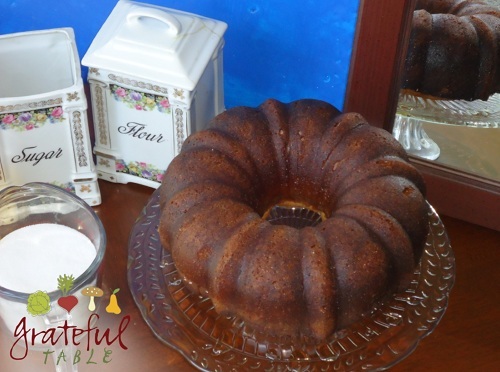 Bake in a buttered bundt pan at 375 degrees for 30 minutes. 9. Leaving cake in pan, pour hot syrup over cake immediately. Let cake soak 2 hours, then turn out onto plate. 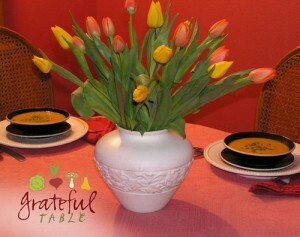 Curried Carrot Soup w/Coconut Milk and Potatoes- Gluten-free! This easy gluten-free soup uses coconut cream and curry powder. A non-dairy soup, perfect for vegans. A garnish of parsley adds contrast; grilled carrots add texture. Makes 6 servings or so. 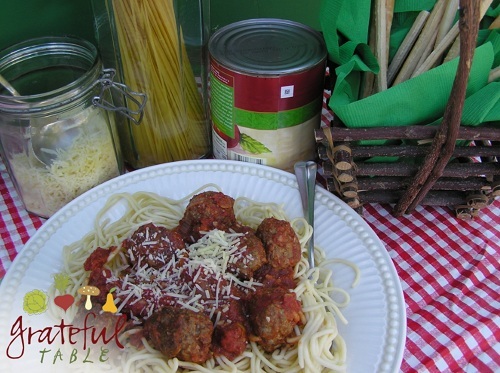 Homemade spaghetti and meatballs are quite a crowd pleaser! The homemade sauce for this is made easier by adding tomato paste last; less stirring is required while the sauce reduces. And the meatballs have that sausage-like flavor, without the extra fat and additives that pork sausage typically has. Another convenience: the browned meatballs are put in the oven for 20 minutes to finish cooking. Less minding of the pan, and the meatballs don’t fall apart as some tend to do. Make a full batch of this large recipe and freeze half if necessary; frozen meatballs covered in sauce keep well for 2 or more months. Serves 8 or so. 6. Ideally, scoop meatballs w/cookie scoop (or hand-roll). Brown batches of meatballs in large iron skillet. Remove to cookie sheet when browned, continuing with process. When finished browning, bake meatballs in 300 degree oven for 20 minutes to cook thoroughly. Add meatballs to tomato sauce, serve w/cooked pasta and Parmesan cheese. To freeze some of it, store in plastic pint containers (or freezer bags), covered with the tomato sauce. This pork recipe offers an elegant entrée for special occasions. “Butterflying” the pork loin roast makes it a large, thinner rectangle. It’s then pounded with a meat hammer to further tenderize the meat. The surface is spread with a corn bread stuffing mixture, and cooked at higher oven heat for 10 minutes, then at a quite low temperature for the remainder. 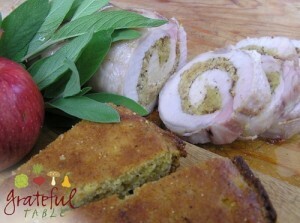 Use the Corn Bread with Apple and Sage recipe for the stuffing (a delicious accompaniment to a meal in its own right). A 3-4 lb. pork loin should serve 6-8. 1. 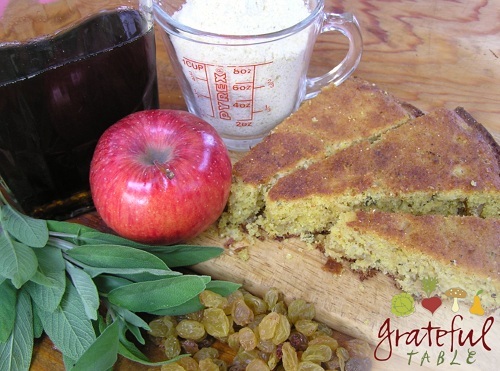 Follow the recipe for Corn Bread with Apple and Sage. Set the corn bread aside. 4. To butterfly the meat, lay it fat-side down, and make a cut down the long, middle part. Do not cut all the way through! Cut a third of the meat open, as if “unfolding” a three-fold menu, creating a new layer of meat as it opens. Make another cut through the other third of the meat, opening it as if “unfolding” a menu, by cutting through the layer of meat. The goal is to make a somewhat round pork loin into a larger rectangle of meat that’s about an inch or so in thickness. Once it is of rectangular shape, pound with a meat hammer to further even out the thickness (which tenderizes the meat as well). 6. Spread the corn bread stuffing on next, to about an inch from the edges. Roll it up like a jelly-roll, and tie the roast with kitchen string, every 2 inches or so. 7. Cook the roast at 450 degrees for 10 minutes only, then at 250 degrees for 50 minutes or so, until internal temperature reads 140-150 degrees with a meat thermometer. Let the roast rest on a cutting board for 10 minutes or so. Remove any clunky droppings from the pan; deglaze the pan, adding some chicken stock, if available, to help loosen the flavors stuck to the pan. Remove the twine from the pork; slice 1/2 inches thick, and serve with the “au jus” (drippings from the pan). 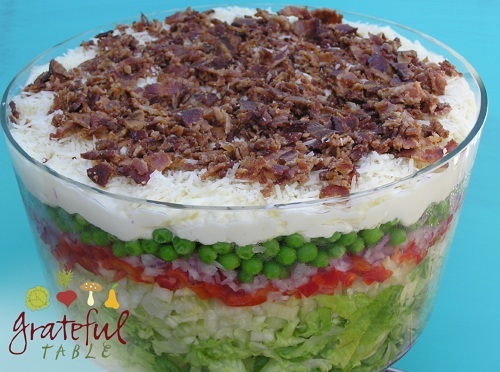 7 Layer Salad, “Seventh Heaven”- Either Way, Good! There are many versions of the 7-layer salad recipe around, and many people probably have their own favorites. This one is my favorite; the combination of green peas and parmesan go so well together, and the flavors of the finely-chopped veggies layered under it permeate the whole salad. As a newlywed (almost forty years ago) I’d take this to many get-togethers, where most everyone would be excited about it. Part of the appeal may be that it contains a lot of finely-chopped salad veggies, so you get all the flavor without having to chew forever. I suspect easy-to-chew food is an advantage at social gatherings, as you can spend more time talking, less time chewing! Serves 8. 2. Layer lettuce in bottom of a deep glass bowl, preferably one with steep, straight-up sides. A trifle bowl (as shown) is perfect. Otherwise, other glass or pyrex-type dishes will work. 6. The bacon can also be cooked the day before. It stays crisp and keeps just fine in the refrigerator overnight. No need to toss the salad before serving; guests can dig in and get salad and dressing all in one scoop. Though this is a quite textured corn bread, it is gluten-free, which can be a plus. 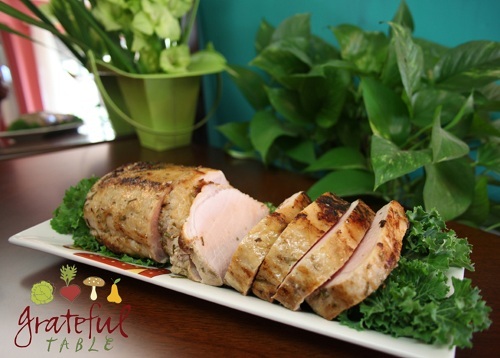 The flavors go well with roasted meats (see Stuffed Pork Loin Roast here). Use whole grain, organic corn flour from the health food store if possible (as opposed to the standard “degerminated” corn meal). Coconut milk can even substitute for the buttermilk. Maple syrup and frozen apple juice concentrate eliminate the need for refined sugar, while adding extra flavor and moistness. Serves 4 (if half is used for the stuffed pork dish), or serves 8 as a side dish. 8. Mix everything up, stirring just until smooth. Add a splash of olive oil to the iron skillet, and pour the batter into the skillet. Bake at 375 degrees for 20 minutes or so, until golden. Serve warm (or room temperature). A whole pork loin (about 6-8 lb.) can be cut in half, making it easier to fit into a zip-lock bag for marinating. If starting with a smaller roast, cut down a bit on the marinade ingredients. It may still take up to 1 1/2 hours to cook; a meat thermometer stuck in the middle of the roast should read 155 degrees when it’s done. There are many ways of cooking the pork loin (longer on low heat, or a shorter time on higher heat); roast it at a steady 325 degrees for a most tender roast. Even for a smaller group, cook up the whole roast (cut in half), and save half for meals later in the week. A 6-lb. pork loin roast will serve 10 or so. 5. Finish roasting the meat and apples, still at 325 degrees, for 45-50 minutes longer, until meat thermometer reads 155 degrees. Remove from oven, letting meat rest for 15 minutes or so, to reabsorb its juices. Slice, arrange on a platter, and serve.